The UEFA Europa League Trophy Tour Driven by Kia will visit eight cities with a goal of collecting football boots for refugees. The tour will give football fans across Europe the opportunity to see the iconic UEFA Europa League trophy as the competition's 2018/19 knockout stage unfolds. Throughout the duration of the UEFA Europa League Trophy Tour, fans and players of all ages will be encouraged to donate used and unwanted boots. In partnership with the UEFA Foundation for children, the boots will be taken to the Zaatari refugee camp in Jordan to be given to Syrian refugees of all ages. What's more, every fan who donates a pair of boots will be in with a chance of winning tickets to the UEFA Europa League final, among other prizes. 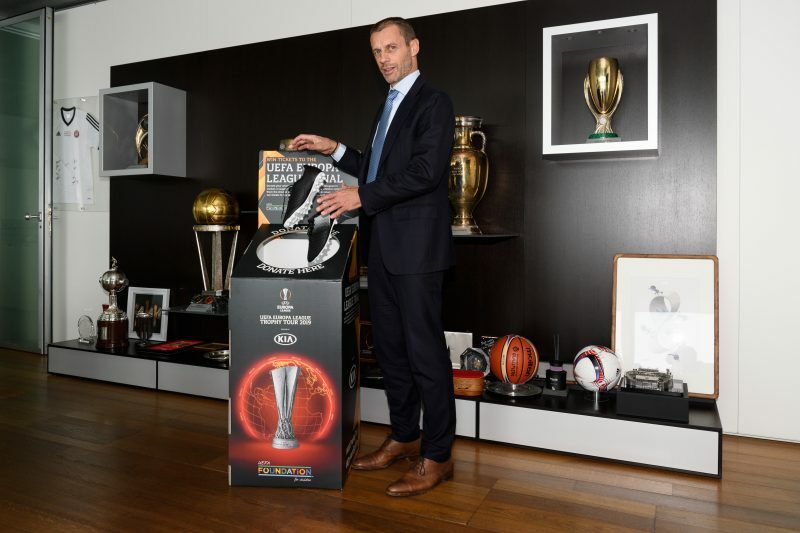 Boot donations can be made at any stage of the UEFA Europa League Trophy Tour, as well as at selected Kia dealerships in each participating country. "I have seen first-hand just how much football means to the children and adults at the Zaatari refugee camp," said UEFA President Aleksander Čeferin, also chairman of UEFA Foundation’s board of trustees. "The UEFA Foundation helped to provide pitches for the refugees to use, but what is lacking are football boots. Therefore, I urge anyone who has a pair of suitable footwear lying around, which they are not using, to donate them and help make a difference." The UEFA Europa League Trophy Tour Driven by Kia begins in earnest at the Geneva International Motor Show on Tuesday 5 March and will end on 16 May, ahead of the UEFA Europa League final in Baku, Azerbaijan. A stellar list of former players has signed up to take part; among those to have confirmed their participation in at least one tour leg are Lothar Matthäus, Deco, Andrés Palop and Eiður Guðjohnsen. "We are delighted with the enthusiasm Kia is showing, especially with their desire to try and reach out to fans throughout Europe and their willingness to give something back to those who want to play the beautiful game but lack the necessary equipment to do so" said Guy-Laurent Epstein, UEFA Events SA marketing director. Kia has the honour of conducting an inaugural tour. 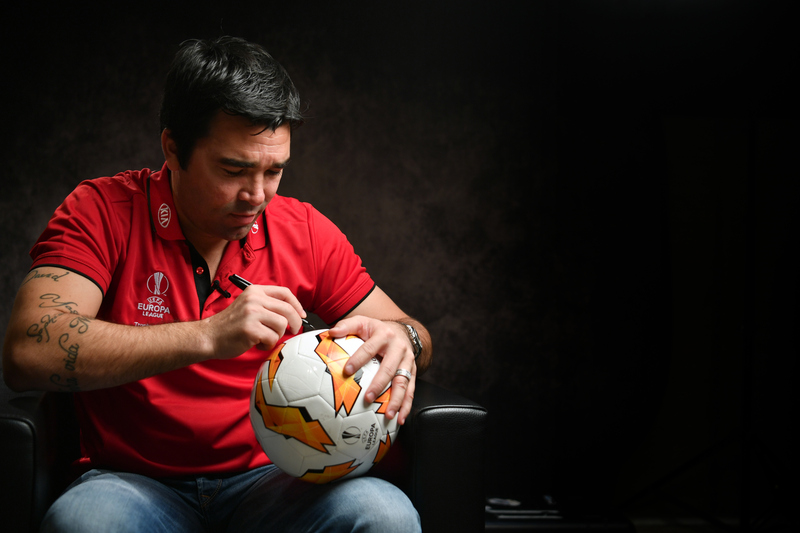 "We are extremely excited to launch the 2019 UEFA Europa League Trophy Tour Driven by Kia, in partnership with UEFA," said Yong-Won Cho, Senior Vice President and Chief Marketing Officer at Kia Motors Corporation. "Not only will the tour give football fans of all ages the chance to see the famous trophy up close, but thanks to their donations we are able to help make a positive contribution to the lives of young refugees who share our passion for the beautiful game. On behalf of Kia I would like to extend our thanks in advance to everyone who supports the campaign and helps by donating football boots." - Yong-Won Cho, Senior Vice President and Chief Marketing Officer at Kia Motors Corporation.